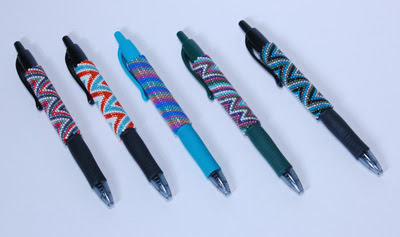 I had so much fun making these new pens! I love playing with color and adding and subtracting different colors of beads from my palette to get just the right combination. My abstract "Jagged Motion" design is perfect for color experimentation. I hope to get these listed in my etsy shop this week. Fellow Dallas Etsians Megan of Harrilu and Ashley of Ashley Akers Jewelry are running cross promotion giveaways! Click here to enter to win a Teal and White Peonies Tunic, and click here to enter to win a red plexiglass Coral Branch Pendant.